These chapulines, or grasshoppers, are delicious when wrapped in a corn tortilla and drenched in chile sauce, or on their own as a quick snack. They are very popular in Oaxaca, Mexico where they are consumed on a daily basis. 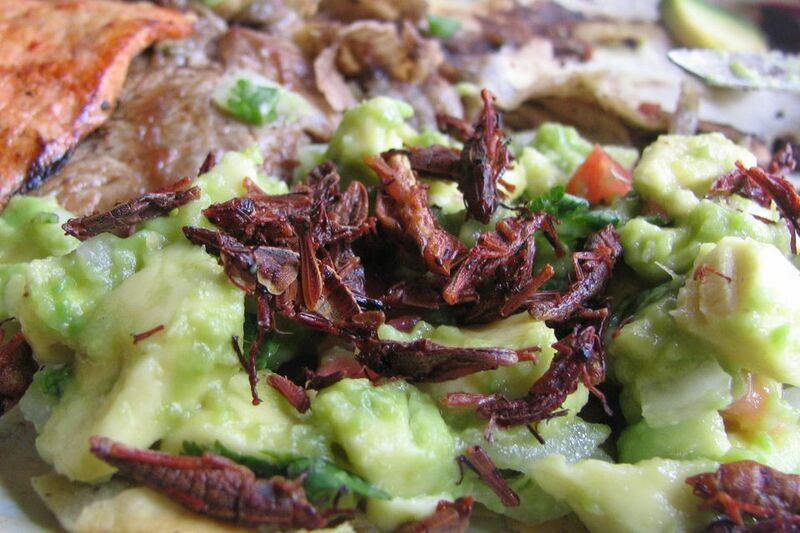 Chapulines are very high in protein yet very low in fat and have a wonderful crunchy texture when cooked properly. Grasshoppers in abundance are hard to find, and even in Mexico they are only found in certain states. But if you do come across a good Chapulines source, you can use this recipe for fantastic results. Grasshoppers can sometimes contain parasites, so cooking them thoroughly is very important. You will need to pull the wings and legs off of each chapuline. Heat the oil in a shallow pan and sauté the garlic, chile, and the onions until the onions are translucent. With a slotted spoon, remove and discard the onions, chile and the garlic from the oil, leaving the oil in the pan. Sauté the chapulines in the oil until they are brown and crispy. Remove the chapulines and drain them well on paper towels. Sprinkle salt over the top, and then squeeze some lime over them. You can enjoy them as a snack or use as a filling for tacos.